When it comes to cooking, I tend to be pretty lazy. Maybe not pierce-the-film lazy, but if I’m attempting a really complicated recipe with lots of steps and pots bubbling on the stove at the same time, chances are I will give up and just have some toast instead. Don’t get me wrong, making something from scratch is a beautiful, beautiful thing. I’ve made bread before and once it was ready I almost considered taking a picture to keep in my wallet. It’s satisfying and humbling. At the same time, it takes hours – and my arms were still sore a week later. There is a beauty to lazy cooking, too. It’s a little sloppy but simple in a wondeful way. I love roughly chopping vegetables and dicing beef and just abandoning them in a slow-cooker, drowned in glossy stock and red wine, only to come back at the end of the day to the perfect stew. Lazy dishes aren’t always quick – they are about minimal effort and tasty, satisfying results. 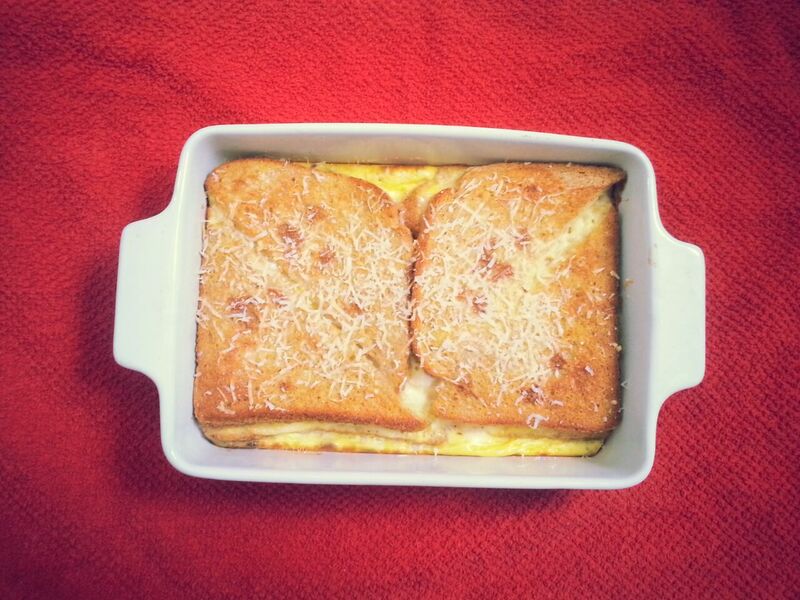 This Croque Monsieur bake is inspired by this Nigella recipe, although I tweaked it quite a bit. It’s basically a savoury bread and butter pudding with cheese and ham and everything nice. It’s super easy to make and perfect for brunch or lazy Sundays – the sort of thing where you simply lug the dish to the bed and eat it absent-mindedly while making plans for the day. I used different cheese to Nigella – Gouda for the sandwiches and Roman Pecorino to grate on top. Pecorino is sharp and instense and lovely and it cuts through the buttery, nutty Gouda wonderfully, but this would be nice with mature cheddar or gruyere. I also used Henderson’s sauce instead of Worcestershire – a good option if you want to skip the ham out and make this a vegetarian dish. Henderson’s pretty hard to find if you don’t live in Yorkishire, but hey, Amazon is your friend. Spread each slice of bread with mustard, then make a sandwich with one slice of ham and two slices of cheese. Cut each sandwich in two triangles and nestle them into an ovenproof dish. Beat together the eggs, salt and milk and then pour the creamy mix over the sandwiches. Cover the dish with clingfilm and leave in the fridge overnight. The following morning, preheat the oven to 200°C. Take the dish out of the fridge, remove the clingfilm, add Henderson’s sauce and grated cheese and bake in the oven for 25 minutes. Once it’s all golden, crispy and gooey, eat. Lovely with a cup of strong tea. (I think this would work wonderfully as Croque Madame, too; just fry an egg and place it on top of the sandwiches before serving).